For the last year or so I’ve been more often than not looking over at the PlayStation 3 and though: “Damn, they have some really nice games over there”. Back then the PS3 had a couple of problems for me. First The price. Paying 600 EUR for a console without a game packed in was simply not an option for me. And second: The AV-outputs. With my Xbox 360 I have the nice option to just hook it up to my 19” computer display and get nice 1280x1024. With the PS3 I’d have to go the HDMI or component route to get some HD and I neither have a new TV with HDMI or component, nor do I have an expensive enough computer display to support HDMI not to mention HDMI + HDCP. 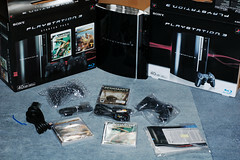 And spending around 800EUR to get any of these, was and still is not an option either. Anyway, today I finally jumped over my own shadow and got a PlayStation 3 Starter Pack. Why? Well, it comes with 2 controller (naturally only Sixaxis, but for now that’s fine with me. I don’t plan to play a lot of racers on the PS3) and it comes with 2 games that I wanted to get anyway: Motorstorm and especially Uncharted: Drake’s Fortune. Then I also noticed on my favorite online store for games that Resistance: Fall of Man was now at a price-point - I guess - that it can be considered a budget title. The same goes for Heavenly Sword, another game I absolutely plan to get. So yesterday night I thought: “I can name at least 8 games I want to get for this system that are out right now or will be released later this month, so why wait much longer? !” Normally 5 titles with at least one or two coming at a lower price are the threshold for me where I really start considering getting a new console. This time it just took longer because of the two problems I named above, but I had heard that the the games are still quite playable in SD, so shrugs.